You are currently browsing the archives for the News/Announcements category. OK…so this is a straigt-up promotion. I admit that and make no apologies for it, because it’s for what I have always said is the best (reasonable sum of) money an InDesign user can spend to advance their knowledge of the application: InDesign Magazine. From now through Wednesday, September 30, you have a chance to get a 2-year subscription to InDesign magazine for the lowest price I’ve ever seen it for: $49. That subscription includes every back issue of the magazine (PDF magazines never run out of copies! ), and…as part of this offer, a free t-shirt. C’mon…who doesn’t love getting a free t-shirt? So act now. Go to http://tinyurl.com/m5hy28 and follow the instructions on that page to take advantage of the offer while it lasts. As reported in an earlier post the custom style mapping feature available in the Microsoft Word Import Options dialog has been broken since InDesign CS4 hit the shelves almost a year ago. Today, with the release of the 6.0.4 update for both Windows and Mac (not yet posted on the InDesign Mac Updates page, but available from InDesign’s Help > Updates… menu), this error–along with other odd bugs and behaviors–is fixed. I haven’t tested the style mapping fix on Windows (I’d welcome any blog reader’s experience on whether or not it’s working as advertised on that platform), but I tested it on the Mac and the functionality has been restored successfully. Even after a quit and restart of InDesign, my custom style map preset was preserved along with all of the style settings associated with it. For those of you who haven’t yet updated to 6.0.4, and the many of you who responded with outrage to my earlier post about this, get yourself updated and back in business. I have no evidence that my earlier post had any influence on Adobe, but the fact that so many people seem to have filed bug reports about it may have helped significantly toward getting the problem the required engineering resources to fix it. Whatever the impetus, I’m glad it’s back. 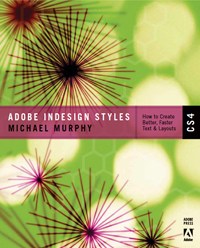 There will, of course, be other stellar InDesign experts there including Sandee Cohen, Anne-Marie Concepcion, Claudia McCue, Jim Maivald (who wrote the XML/CSS chapter of my book), Russell Viers, as well as Adobe’s own Rufus Deuchler, Noha Edell and Michael Ninness. Check out the MOGO Media site for a complete schedule and session descriptions, and to register online. You can save $100 off the regular price if you register before October 2, 2009 and an additional $50 off if you register before September 15 with the discount code MMEB09JF (note that the code is case sensitive). Peachpit Press is offering a 35% off list price discount on Adobe InDesign Styles on the Peachpit.com web site and use the discount code INDESIGNSTYLES. After six months, tens of thousands of words, and many late nights, I have finally completed my book for Adobe Press, “Adobe InDesign Styles: How to Create Better, Faster Text and Layouts” which is available for pre-order at Peachpit.com and at Amazon.com and will be shipping in the second half of April, 2009. I’m both glad to be done with it and very pleased with the end result: the first ever exploration of every InDesign style type, and all other features in the application that are “wired into” styles.